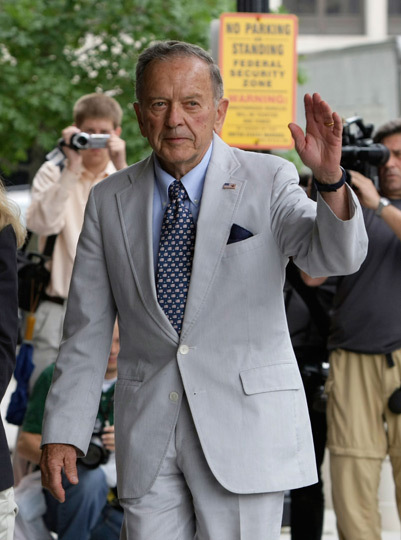 Stevens Pleads Not Guilty To Federal Charges Alaska Sen. Ted Stevens pleaded not guilty to federal charges that he lied about gifts from an oil services contractor. Stevens, the longest-serving Republican in Senate history, was indicted earlier this week on seven counts of lying on Senate disclosure forms. 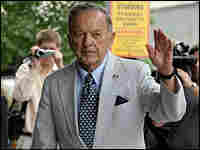 U.S. Sen. Ted Stevens waves to cameras as he arrives at the U.S. District Court in Washington, D.C., for arraignment. Alaska Sen. Ted Stevens on Thursday pleaded not guilty to federal charges that he lied about hundreds of thousands of dollars in gifts from an oil services contractor. Stevens did not speak when U.S. District Judge Emmet G. Sullivan asked for his plea, instead allowing defense attorney Brendan Sullivan to answer for him. Stevens, the longest-serving Republican in Senate history, was indicted earlier this week on seven counts of lying on Senate disclosure forms. He has said little about the corruption investigation that has gone on for more than a year. The indictment is a blow to the senator's re-election bid. Once a seemingly invincible political figure, he now faces both Democratic and Republican challengers who hope his legal woes make him vulnerable to defeat.